One of America's top automobile magazines, er Automobile Magazine, has awarded it's top honor, Automobile of the Year 2013, to a brand new electric car, the Tesla Model S. That's a big win for the start-up automobile manufacturer, Tesla Motors, on its first self-designed self-manufactured car. In winning this endorsement the Model S beat out "real" candidates like the Suburu BRZ or Porsche Boxtser, and won what we can only call gushing praise from the editors of that magazine. The Tesla Model S is the first car designed fully by Tesla's own engineers. The company's previous car, the Tesla Roadster, was essentially an electric conversion built on top of a Lotus Elise chassis. The Model S is, on the other hand, a luxury sedan, that can seat up to 7 people (depending on the options chosen), carry a prodigious amount of cargo thanks to trunks in both the rear and front, drive on electric power for an amazing 265 miles, fully recharge in about an hour at the appropriate charging station, and deliver a 0-60 miles/hr time of 4.3 seconds. Musk has said the company's goal with the Model S was to deliver the best car ever, that happens to be electric. The Automobile Magazine editors note this drew healthy skepticism (or outright hostility) because manufacturing a car is hard, and many clearly thought an upstart from Silicon Valley wouldn't be able to pull off the things Elon Musk and Tesla Motors have promised. To not only develop a class-leading sport sedan, but it would have an electric drive train more advanced than other automakers were delivering. That's the criteria the Automobile Magazine editors say they had for evaluating the Model S. Did it live up to Musk's bold brash claims? What did they find? That the Model S simply blew away the competition. "It's the performance that won us over," said Automobile Magazine editor-in-chief Jean Jennings. "The crazy speed builds silently and then pulls back the edges of your face. It had all of us endangering our licenses." They tested a Signature Performance Model S, meaning that it was tuned up a bit, and had a beefier electric motor, than the regular Model S. The 416 HP electric motor delivers the 0-60 time of 4.3 seconds, but they said the raw performance metric simply is inadequate to describe what it actually feels like. The editors wrote about how "alarming" it was for such a "big car" to accelerate so quickly and quietly, and that the Model S is "silly quick" and completely not at all like driving a Nissan Leaf or Chevy Volt. It was more than just the performance that won them over. There are a number of touches to the interior design elements. Tesla lead designer Franz von Holzhausen is quoted saying "We turned a lot of preconceived notions on their head and said, 'Why does it have to be that way?'" The Automobile Magazine editors point out that nearly every new car claims to be revolutionary, but they felt the Model S actually felt like it was, leaving the editors "reaching outside the automotive lexicon to describe it" and finding a metaphor like "It reminds me of the first time I used an iPhone." Some of the revolutionary design elements they point to are: The flush door handles that pop out to meet your touch; That the arrangement of drive train components left oodles of space to make the cabin feel airy and spacious, while offering both front and rear cargo areas; The enormous 17" display in the center console, with its amazing features that include the ability to surf the Internet with a web browser; and the Panoramic roof that's controlled by an app running on the center console. This is the kind of car which arises from having a clean sheet of paper, rather than a hundred years of history and entrenched ways of doing things. At the same time, while Tesla was able to design from a clean sheet of paper, the company hired a team of engineers from all over the automobile industry to do that design. 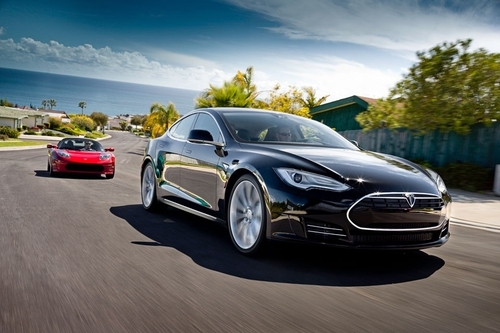 Automobile Magazine also gave the Model S high marks for its performance as an electric car. Unlike prior electric cars they'd tested, all of which required shorter test routes and special handling, the Model S was treated like any other car. That happened to be electric. That meant they plugged the car in at night, then drove it hard the next day. With awarding the Model S with this honor, the editors recognize that Tesla might not make it to become a financially viable company. What they are saying with the award, is that Tesla Motors deserves to succeed. That the company has managed to blend the Silicon Valley start-up atmosphere, with automobile manufacturing expertise, and deliver on the bold promises Elon Musk made. Whoa. Now it gets interesting. If this car can come down just a smidge in price everything is going to be very different. Tesla needs a major partner (like Toyota) to make their operations succcessful. Maybe the Rav-4 project was Toyota's way to see how they liked Elon and the other folks over there? That would be a very Japanese way of peeking under the other guy's kimono. TOYOTA ? Keep dreaming they have just stated that they consider the electric car not viable. What TOYOTA really means is that without PANASONIC whom they seriously hurt ten years ago they have no clue how to make an electric car. That is why the new token RAV4-EV that is a compliance vehicle in tiny numbers has 10% less range with today's tech than the 1997 RAV4-EV had. If they had continued their original NiMH based RAV4-EV it would have been up to 300 mile range by now. But all the know how was PANASONIC not TOYOTA. Good insight. I don't know that story. I picked Toyota out of the blue, but I don't think any of the electric car makers can survive long selling a couple hundred cars a year at a tremendous loss. However, the mainstream automakers can and do have that business model because their truck and ginormous SUV sales can subsidize it. Even small cars that sell in good numbers hurt the automakers, there just isn't any profit in it. Take wheels for example. What do you think Fisker paid for the crazy 22 inch wheels and tires it put on the Karma? A mainstream automaker could have done the job as well for half the cost. People make fun of Toyota for mounting the exact same size wheel on the on Scion FT-S as on the Prius, However, the Prius sells 250,000 units a year, so 1 million tires exactly (see that math!) I would bet that the tire maker would give Toyota the 4,000 or so it needs for FT-S models this year free just to get that 1 million unit order. Whoa, just found a topic!